Well, I probably don’t have to tell you that I was shocked. Appalled. And then I was terrified. I thought, “Could that happen here? Could we be a United Methodist Church that doesn’t know what the Wesleyan Quadrilateral is?” And then do you know what I thought? So I have now made it my personal mission – if I accomplish nothing else here at Hanscom Park United Methodist Church – to make sure everyone knows the Wesleyan Quadrilateral. I know I mentioned it before, and some of you might have heard of it already (like last week in the confirmation-for-all class). So this will be a review for you. So, what is the Wesleyan Quadrilateral? We will call it “the Quad” for short. Well, historians and theologians talk about our founder John Wesley as having used The Quad in his theological reflections. When he was asking questions about God and what it means to be a person of faith, he considered that using different lenses or perspectives. The parts of the Quad are the lenses that Wesley used to think about topics. S is for Scripture (this is the foundation of the Quad). Repeat this to yourself until you have it memorized. Great. My work here is done. But seriously, the T-part of the Quad, “tradition” gets me to the actual topic of the sermon today. You see, I believe that the Christian Tradition is absolutely essential for us to understand today’s big word: Trinity. I think it would be pretty tricky to come up with the doctrine of the Trinity just using our own Reason, Experience, and Scripture. We really rely on the Christian tradition, and it started with a deacon named Athanasius. He lived in the 4th Century, and he helped create the doctrine of the Trinity. That doctrine has been passed down in the tradition for like 1700 years. Now I know you know something about the Trinity. The doctrine of the Trinity asserts that God is one God in three persons. God the Father, God the Son, God the Holy Spirit. Right? The tradition says that these three persons are all present in our one God. So, mathematically, we’ve got 1+1+1=1. Just like last week, we’ve got fuzzy math. Just like the incarnation – the Trinity logically, rationally, is something of a mystery. How can God be one and yet also be three? Well, to be honest, that answer is pretty difficult to extract from scripture. But if we had to make an argument from scripture, I might point us to the John 14 text we just heard. In it, we’ve got the three persons of the Trinity present in one passage. That’s a good start. In verse 20, Jesus says, “I am in my Father.” This gives us some sense of the oneness of the Son and the Father. Jesus also mentions this other person, the Advocate (sometimes called the Paraclete) who will be with the disciples forever after Jesus leaves. This Paraclete is the Holy Spirit – the same Spirit we talk about on Pentecost. This is the same Holy Spirit who moved across the waters during creation to make life spring forth. It is the very same Holy Spirit that fell upon the disciples in Acts, chapter 2, when She arrived with a sound like rushing wind and like tongues of fire that touched each person present. And here in John 14, Jesus talks about the Spirit as “another Paraclete” – as if Jesus himself was a Paraclete of sorts, one who reveals the Father to his disciples. As Jesus revealed the Father in the past when he was present among them, so the Holy Spirit will come and reveal the Father forever. You hear get the Trinity image starting to form. Actually looking at images can help us out as well. This is an icon by a Russian painter named Andrei Rublev. See how there are three people sitting around a table? 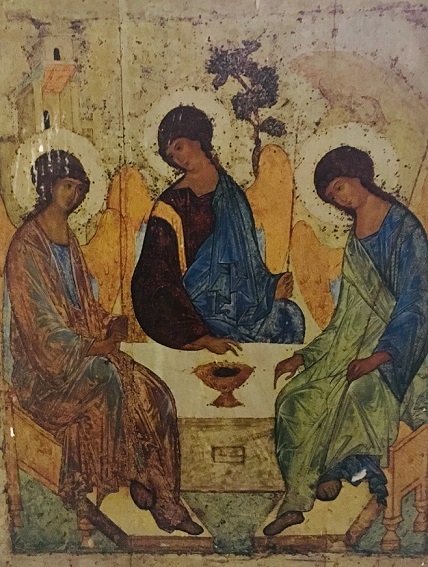 This is Rublev’s imagination of what the Father, Son, and Holy Spirit might look like. You know, just hanging out around a table. Now, when we look at this, one might think it looks like we have three Gods. Which is problematic for a number of reasons both logically and scripturally. But if we think back a moment ago to the three-person dance I did with the kids…We remember God is not simply each person in the dance. God is not three individual persons sitting around a table. God is both the persons and the relationship between the persons. God is the dance itself, made up yes of persons but also made up of the activity of the dance and maybe most importantly, the relationship between the dancers. The idea that the three persons of the trinity are involved in a divine dance, by the way, is another big word…the biggest in this series. Prepare yourselves. That word is Perichoresis. Perichoresis roughly translated means “to make space around.” When the Father, Son, and Holy Spirit are in this divine dance, they are making space around another – making room for each to do their part in the creating, redeeming, and sustaining of the whole cosmos. Now, does that mean that there are literally three people dancing around in a circle somewhere? Nope. Remember from last week that all of our words and images and metaphors for God fall short of the mystery of who God is. These images are just a tool to connect with and respond to God, even when we can’t quite comprehend God. Our three-in-one God is not just the three persons of the Trinity. God is even more. God is the dance, the relationship, and the love shared between the three. God is not just the three persons of the Trinity. God is even more. God is the dance, the relationship, the love shared between the three. We are invited to be part of the dance. The Holy Spirit, the one that Jesus describes as the Paraclete in our scripture today…She is the very Spirit of God who is moving in us and around us and among us. If Jesus WAS God-with-Us back then, the Paraclete IS God-with-us now, calling us in every moment to be part of the divine dance. She has always got her hand out, inviting us to join, to participate in love and hope and peace and mercy and justice and joy – whatever life-giving, creative thing God is doing! Yes, the doctrine of the Trinity is something we could explain and then say that we believe – like we do when we say a creed. We could intellectually agree with the statement that God is three persons sharing one substance, co-equal and co-eternal. We could totally do that. I could teach you to memorize those words and affirm that. I could totally teach you to explain the Trinity. But you know what? I think “How do you explain the Trinity?” is the wrong question. It’s the wrong question to be answering if we are interested in more than proving we have some doctrine right – if we are interested in actually encountering the Living God. The question is not: can you explain exactly how the Trinity works? The question is not: so what exactly does each person of the Trinity look like or do? The question is not: do you swear allegiance to an irrational math problem? The question is: have you heard the music? The question is: do you sense the Spirit? The question is, finally: will you take Her hand and be swept up in the dance? 1) When did you first hear about the Trinity? Did it make sense to you? Was it confusing for you? Did you learn any metaphors or images to help you understand it better? 2) When in your life do you feel most aware of the presence of God / the Holy Spirit? When do you feel least aware of God’s presence? 3) Have you ever felt like God was inviting you to do something or respond in some way? How did you respond? What did you do?